The roof of the new Copenhagen Opera House is one of the largest canopy roof structures in the world, and with plan dimensions of 158m by 90 m, it equates to the size of three football fields. Ramboll used LUSAS finite element analysis to assist with its innovative design of the structure in order to ensure the necessary strength, stability and dynamic response was achieved. The roof is actually comprised of two separate structures, the west roof and the east roof. 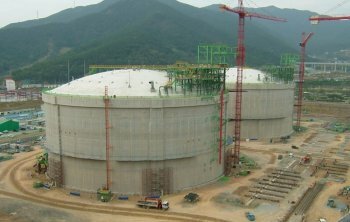 The 78m x 98m west roof (shown right) is supported on ten columns which are located around the curved foyer, and on four roller bearing supports located on the interior concrete walls along the fly tower. The roof cantilevers 32m from the most westerly foyer columns and 21m in both the north and south directions resulting in a maximum cantilever distance of 43m when measured from the outer corner of the roof to the nearest foyer column. 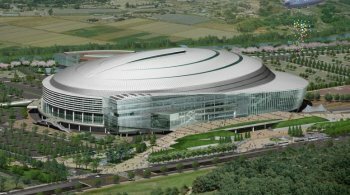 Because of its size and the architect's requirement for the roof to have the smallest possible depth and to taper to virtually nothing the technical challenges for its design were many. The eventual solution of constructing the cantilever roof as a closed steel box is taken directly from modern steel bridge design. It was important that in any final roof design the first mode shapes involved not only localised deformations of the outer corners but included deformations of the whole roof structure to ensure a dynamic response of the roof within acceptable limits. It had to be able to safely resist the large temperature differences in winter between the cantilevered part and the internal roof over the foyer. Ramboll chose to construct the cantilever roof as a closed steel box because a significantly higher flexural as well as torsional rigidity is obtained compared to that for a traditional lattice roof structure. Bulkheads inside the steel box are arranged at 5m spacing in both horizontal directions. Longitudinal troughs are welded to the top and bottom plates only, as is common in steel orthotropic bridge deck design. The plate thickness is very thin in relation to typical bridge design, being limited to 6mm in the main part of the cantilevered structure and only increased to 15mm in the region near the foyer columns. The roof structure could not be designed as a closed box over the total area because of differential temperatures, but was divided into a section made as a box and the remaining section made of a number of girders. The outer ring beam forms the inner closure of the box, and the radial beams are designed so that the flaring of the beams can absorb the horizontal axial stresses from the box structure. The foyer balconies are supported by vertical hangers, which are anchored in transverse beams spanning between the radial beams. Four roller bearings are arranged between the box structure and the truss girders over the foyer area. The roller bearings allow differential horizontal movements between the box structure and the truss girders Along the three edges of the roof, outside the box structure, truss girders are arranged to support the outer roof. A slenderness ratio b/t of approximately 70 determined the distance between the troughs. To analyze stability problems in the slender plates, Ramboll developed comprehensive new formulas for biaxial stress combinations, which included post-critical stresses and not only initial buckling stresses. These formulas led to significantly lower plate thicknesses in the cantilevered roof. The roof was designed for wind, snow and dead loads, as well as for stresses caused by temperature and for any settlement of the foyer columns.The wind load was based on results from wind tunnel tests. A 3D LUSAS model of the closed box and the girders of the roof structure was used for both static and dynamic analyses and these calculations determined all the normal stresses in the plates, parallel and perpendicular to the troughs, as well as the shear stresses and all internal forces in each beam in the girders. The static analysis proved the box structure to be an optimal solution, due to the use of stresses in both directions of the plates in combination with the shear stresses from the large torsional moments in the structure. Preliminary studies for a truss girder roof indicated an unacceptable repsonse. By constructing the roof as a closed box the dynamic wind load was reduced to an acceptable level, and damping devices were not required. Eigenvalue analyses with LUSAS showed that the first mode shape for the closed box roof involved not only local deflections of the outer corners, but also a global deflection of the entire front of the roof. A wind tunnel test was carried out to determine the time averaged wind load on the structures and the fluctuating wind load, which were combined with mode shapes, natural frequencies and modal masses of the structures to determine the dynamic response. The external cantilevered part of the roof forms a horseshoe around the foyer area, and contracts in winter compressing the structure over the foyer. Roller bearings sit between the cantilevered box and the foyer girder portion of the roof and release the differential horizontal deformations in the north-south direction, and can transfer compression/tension forces in the vertical direction. Carrying out a differential temperature analysis with LUSAS showed how the structure over the foyer contracts in the north-south direction, the girders will deflect horizontally and the entire foyer structure moves towards the east. Hans Exner, Senior Chief Engineer at Ramboll said: "All of us at Ramboll are really proud of this building. It was a very valuable project for our client, for Copenhagen and for ourselves. We used LUSAS finite element analysis as the main structural analysis tool for the design of the cantilevered roof and it assisted us greatly in the solving of the main design challenges involved." The Opera House opened on 15 January, 2005. It received the 2008 International Association for Bridge & Structural Engineering's Outstanding Structure Award, principally in recognition of the innovative design of its roof. 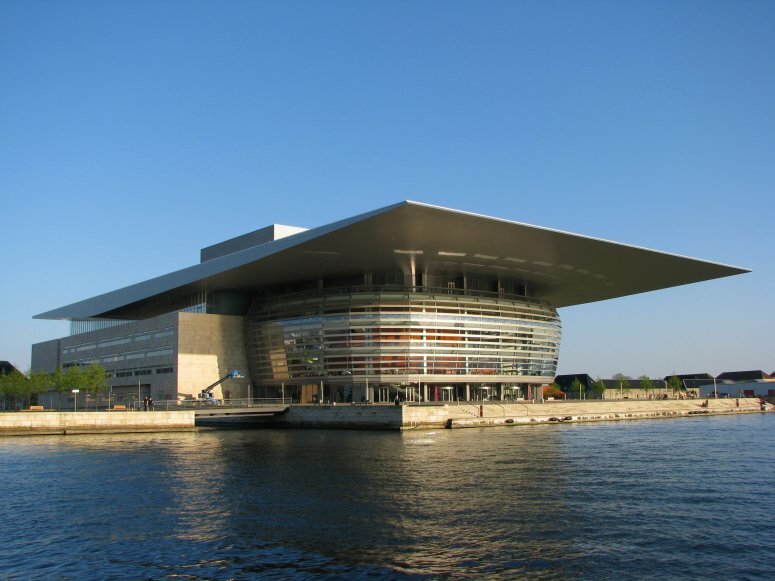 "Bridge Deck Technology for the Copenhagen Opera House, Denmark." published in Structural Engineering International magazine, issue 1/2005. 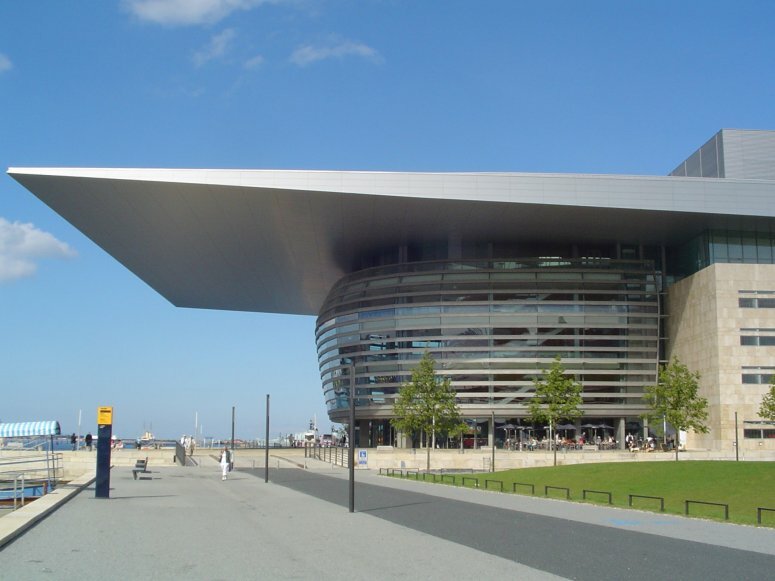 "Opera House, Copenhagen: Outstanding Roof Structure." 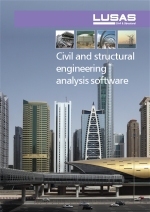 published in Structural Engineering International magazine, issue 2/2009. "We used LUSAS finite element analysis as the main structural analysis tool for the design of the cantilevered roof and it assisted us greatly in the solving of the main design challenges involved."